Arms Control Law among the ABA Journal’s Blawg 100 Again! I just got word recently that Arms Control Law has been chosen once again for the American Bar Association Journal’s Blawg 100 list, as one of the top 100 best blogs for a legal audience. You can see the new list here. This marks the third year in a row that ACL has received this distinction. I want to thank everyone who took the time to nominate ACL for this recognition again. I really appreciate it. I’d also like to thank all of the contributors to the blog who have written pieces in the past year. I’d like to particularly recognize Jean-Pascal Zanders, whose pieces on CBW have been fascinating. I know I haven’t written a lot just lately on ACL. It’s been my heavy teaching semester this Fall and I’ve been traveling some. But I have been making some plans for the blog going forward that I’ll announce more formally soon. They include a new podcast series that I’ve been developing with the IT staff here at Alabama Law. I think that will be an exciting new feature. For those interested, my book on Iran is in the final stages of writing. I had to step back a bit from the manuscript when the JCPOA was announced this summer. I was actually just about done with the manuscript when the deal was announced. But my publisher and I eventually agreed that it would be best to hold off publication until I could write a serious final chapter covering the JCPOA and its legal implications. That has meant monitoring the implementation of the JCPOA closely, and trying to choose a moment when the deal is solidified in its status to write the final chapter. I think we’re fast approaching that point now, with the IAEA report on PMD due this week, setting the stage for the likely occurrence of Implementation Day during January or February. So I hope to have the manuscript done within the next month or so. This will (hopefully) mean that the book will be in print by May-June. 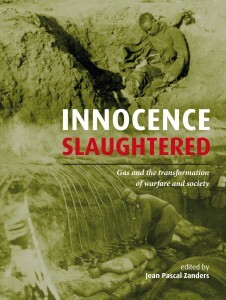 I’m trying to convince OUP that the book will appeal to a broad enough audience to justify a paperback edition and a hardback edition. I really want the book to be widely read, and having a less-expensive paperback option would really aid in that. Board of Governors.” (Italics added) So unless France is able and willing to seriously rock the boat, the BoG can be expected to close the PMD investigation in Iran within the next few weeks. Iran has said that it won’t move further toward implementing its commitments under the JCPOA until the PMD issue is closed. So, high drama still afoot and will be for the foreseeable future. For now, I mostly just wanted to let readers know about the ABA Journal distinction and thank those who contributed to the blog in the past year. CW incidents alleged by the Syrian government: an industrial chemical as likely cause? My previous posting (16 November) presented the findings by the Fact-Finding Mission (FFM) of the Organisation for the Prohibition of Chemical Weapons (OPCW) concerning allegations of the use of chlorine as a chemical weapon in Syria’s Idlib Governorate. The FFM concluded that the incidents likely involved the use of a toxic chemical containing the element chlorine as a weapon. This report was one of three that the Technical Secretariat of the OPCW transmitted to states party to the Chemical Weapons Convention (CWC) for consideration at a special session of the Executive Council on 23 November. The other two reports address allegations of mustard agent use at Marea in northern Syria and chlorine attacks against Syrian government forces around Damascus. This contribution focusses on the latter investigation. Syria submitted four Notes Verbales alleging a total of 26 chemical weapon (CW) events resulting in 432 casualties. The first reported incident dates back as far as 19 March 2013; the most recent ones took place in May 2015.
is of the view that those affected in the alleged incident may have been exposed to some type of non-persistent, irritating airborne substance, following the surface impact of two launched objects. However, based on the evidence presented by the Syrian National Authority, the medical records that were reviewed, and the prevailing narrative of all of the interviews, the FFM cannot confidently determine whether or not a chemical was used as a weapon. The FFM was unable to identify a specific irritant, but believes an industrial chemical may offer the most plausible explanation for the reviewed symptoms. It as good as ruled out use of chlorine or nerve agents in Jobar on 29 August 2014. Conclusions about some other incidents reported by the Syrian government will be part of the final report. The Syrian Deputy Minister for Foreign Affairs and Expatriates, who also heads the Syrian CWC National Authority, submitted Note Verbale 150 to the Technical Secretariat on 15 December 2014. The document alleges 10 separate CW incidents in four Damascus neighbourhoods between April and September 2014 that resulted in 92 casualties, all among military personnel. Syria’s Permanent Mission to the OPCW delivered Note Verbale 41 to the Technical Secretariat on 29 May 2015. It lists 13 separate incidents, five of which preceded Syria’s accession to the CWC, four whose dates fall within the date range of Note Verbale 150 and an additional four that took place early in 2015. These attacks allegedly occurred in the areas surrounding Aleppo and Damascus. Although this note is less explicit about the nature of the victims, it lists a minimum of 317 casualties, including at least five civilians. The document offers details on suspected chlorine use. The Syrian authorities requested members of the advance team (who deployed to Syria from 25 to 29 May 2015) that these events be included in the scope of the FFM. That, however, proved impossible without a new mandate covering additional events. It is interesting to note that some of the incidents predating Syria’s accession to the CWC had already been examined by the UN investigative team in August and September 2013. That investigation corroborated allegations of CW use at Khan Al Asal and described the incident as ‘a rapidly onsetting [sic] mass intoxication by an organophosphorous compound in the morning of the 19 March 2013’, but added that ‘the release of chemical weapons at the alleged site could not be independently verified in the absence of primary information on delivery systems and of environmental and biomedical samples collected and analysed under the chain of custody’. The two other incidents alleged in Note Verbale 41 took place immediately after the infamous Ghouta attack of 21 August 2013 and had also been investigated by the UN team. Of the one at Al-Bahriya (spelt as Bahhariyeh in the UN report) on 22 August 2013, the UN team could not corroborate the allegation. Blood samples all tested negative for any known signatures of chemical warfare agents. With respect to the incident at Jobar on 24 August 2013 the UN report confirmed a ‘relatively small scale’ use of sarin against soldiers. However, again ‘in the absence of primary information on the delivery system(s) and environmental samples collected and analysed under the chain of custody, the United Nations Mission could not establish the link between the victims, the alleged event and the alleged site’. Note Verbale 41 is equally intriguing for the absence of several other alleged incidents between March and September 2013 investigated by the UN team. These presumably concerned the investigation requests by France, the UK and the USA included in the mandate of the investigators by UN Secretary-General Ban Ki-moon. Note Verbale 41 also lists some incidents not addressed by the UN team. It is clear that the OPCW has all but ignored the allegations prior to Syria’s accession to the CWC. Note Verbale 43 dated 3 June 2015 reports three additional incidents in May 2015. Note Verbale 47 dated 15 June 2015 comprises six incidents that had already been mentioned in Note Verbale 41, but offers more background information, including greater detail on events, greater precision of sites of alleged attacks, and references to symptoms suffered by the exposed victims. Based on Notes Verbales 41, 43 and 47, the FFM was dispatched for a second investigative deployment. In view of the large number of allegations, the FFM was unable to investigate each one or had to sequence investigations based on the severity of allegations. Thus it was agreed with the Syrians that the FFM would focus initially on the Jobar event of 29 August 2014 because it involved the highest number of reported casualties in Note Verbale 150. After receipt of the additional Notes Verbales, the FFM proposed additional investigation of two allegations in 2014 and one in 2015. Based on additional data supplied by the Syrian government, the investigative team eventually looked into five reported events during its second deployment: Al-Maliha on 16 April and 11 July 2014, Al-Kabbas on 10 September 2014, Nubel and al-Zahraa on 8 January 2015, and Darayya on 15 February 2015. The FFM is of the opinion that it would have been able to be more precise in its findings if further objective evidence, complementing what was provided by the authorities of the Syrian Arab Republic, had been made available to the team. The FFM was not able to obtain hard evidence related to this incident, either because it was unavailable or because it was not generated in the first place. The lack of hard evidence precluded the FFM from gathering further facts in a definitive way. while the general clinical presentation of those affected in the incident is consistent with brief exposure to any number of chemicals or environmental insults, the visual and olfactory description of the potential irritant does not clearly implicate any specific chemical. This particular investigation was also hampered by the delay of some nine months between the alleged incident and the start of the mission. Notwithstanding, the FFM all but ruled out chlorine and organophosphorous compounds (e.g., sarin) as agents responsible for the described symptoms. High on the list of probabilities figures diBorane, which besides use as a rocket propellant also has application in electronic industries and the vulcanisation of rubber. As the report notes, these uses make it ‘relevant to the interests of a militarized non-state actor [and it is] also readily available in the region’. Many of the reviewed symptoms appear consistent with exposure to this non-persistent and volatile chemical. The report on the allegations raised by the Syrian government is preliminary. The Jobar investigation is in the process of finalisation. The other mentioned incidents also remain under investigation pending final analysis. The interim report only contains an overview of activities undertaken until October 2015. These findings will also be included in the final report. On 29 October, the Technical Secretariat of the Organisation for the Prohibition of Chemical Weapons (OPCW) circulated three reports on investigations of alleged chemical weapons (CW) use in Syria. On 5 November Reuters published some details from the one addressing the alleged use of sulphur mustard agent in Marea, a town to the north of Aleppo, on 21 August. The two other reports address a series of incidents between 15 December 2014 and 15 June 2015 at the request of the Syrian government and between 16 March and 20 May 2015 in the Idlib Governorate documented by a variety of non-governmental sources. For the purpose of clarity, the OPCW maintains a single Fact-Finding Mission (FFM), which has so far produced six reports. Under the FFM, the OPCW may deploy different teams to different locations. The most recent reports will be released as part of the monthly OPCW reports on Syria to the UN Security Council, presumbly at the end of this month following the special session of the Executive Council on 23 November called to consider the findings. The Idlib Governorate lies to the south-west of Alleppo. During the spring of 2015 the international press and social media reported a string of incidents suggesting the use of chlorine as a weapon. In itself, no one source of information or evidence would lend particularly strong weighting as to whether there was an event that had used a toxic chemical as a weapon. However, taken in their entirety, sufficient facts were collected to conclude that incidents in the Syrian Arab Republic likely involved the use of a toxic chemical as a weapon. There is insufficient evidence to come to any firm conclusions as to the identification of the chemical, although there are factors indicating that the chemical probably contained the element chlorine. 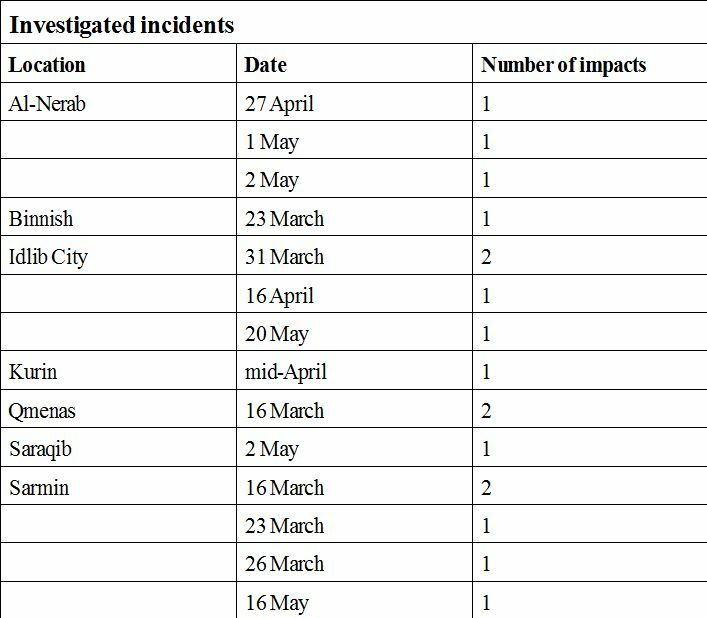 The report documents 17 incidents in 6 locations between 16 March and 20 May 2015. They were responsible for six fatalities. The report also included a depiction of a so-called barrel bomb, based on the various testimonials and collection of bomb fragments. It notes that the design of the improvised weapon underwent an evolution of their manufacture, probably driven by trial and error. However, only a singly type appears to have been used in the Idlib Governorate between March and May 2015. 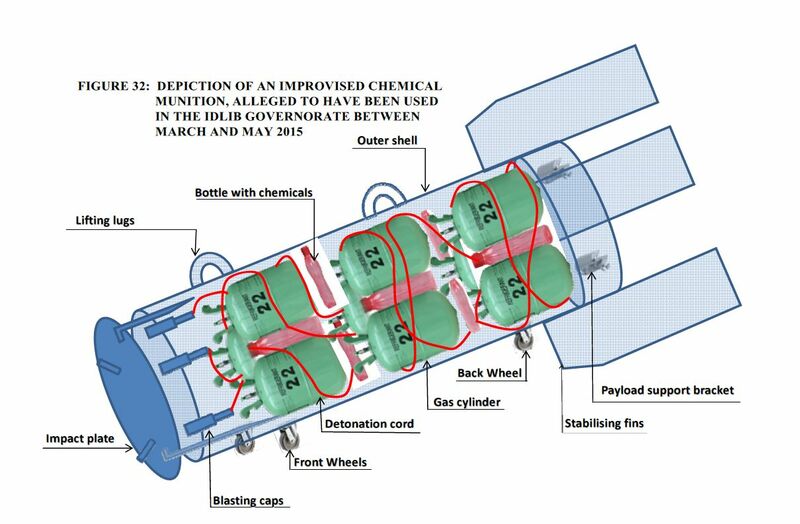 The configuration consists of 9 gas cylinders (green) presumably filled with poisonous chemicals. The report suggests that they may have been filled with a chlorine or chloride containing compound. The flasks with potassium permanganate (pink) would then have been used to oxidise the chlorine containing compound, resulting in Cl2. The potassium permanganate may be responsible for the purple–red colour occasionally seen in pictures and video footage of impact sites. This depiction definitely explains how high concentrations of chlorine were achieved locally, earlier assessments of improbability having been based on the assumption of the dropping or firing of single gas cilinders fitted with a light detonator. Interestingly, the barrel bomb configuration would not have contradicted this assumption, given the individual rigging of gas cylinders (see Brown Moses’ speculation on this in 2014) and the focus of outside observers on those cylinders. To the best of my recollection, only a single report on developments in Syria in 2014 prepared by Human Rights Watch made a passing reference to the possibility: ‘evidence strongly suggests that Syrian government helicopters dropped barrel bombs embedded with cylinders of chlorine gas on three towns in Northern Syria in mid-April‘. As usual and for good reason, the reports by the Technical Secretariat remain careful in their conclusions. 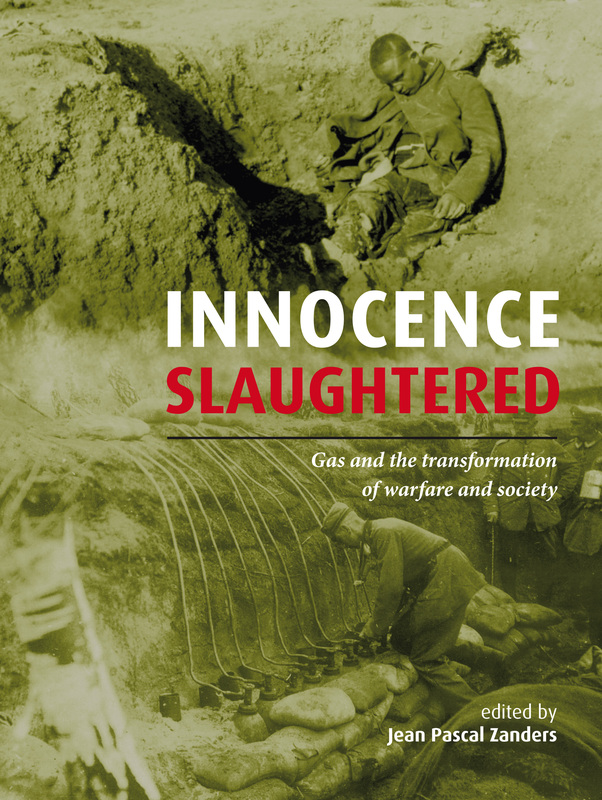 Determination of reponsibility for the violation of the Chemical Weapons Convention and other legal instruments banning chemical warfare is pre-eminently a political judgement. As noted earlier, the Executive Council will consider these findings (as well as those in the other two reports) on 23 November, after which they will be transferred to the UN Security Council. They will also inform the Joint Investigative Mission established by the UNSC in August, whose principal task it is to determine responsibility for chemical warfare in the Syrian civil war. The description of the alleged chemical weapon and its deployment derives from several inputs, as previously described. The features of the improvised chemical bomb are consistent with its being designed for deployment from a height. As most incidents happened during darkness, it is not surprising that no interviewees claimed to have seen the means of deployment. The deformation of the remnants is consistent with mechanical impact and explosive rupture, rather than explosion causing deflagration. Witnesses also reported a lesser explosive sound than for other more conventional types of bombs. Moreover, casualties’ signs and symptoms do not include physical injuries that would be expected from the deployment of an explosive device. The craters which have been claimed to have been caused by the device are also consistent with its being dropped from a height with lesser explosive power. It is therefore reasonable to assume that the devices were not designed to cause mechanical injury through explosive force but rather to rupture and release their contents. I’m not sure what it means to have “deep ties to the U.S. intelligence and military establishment,” but if that on its own is enough for a foreigner to be arrested in Iran, then this sends a very discomfiting message to people like me who have for some time wanted to visit Iran, but who have both visceral and intellectual concerns about making it back out of the country. I mean, like most people who write about nuclear nonproliferation issues, I know people in U.S. intelligence and military agencies. Does that mean I have “deep ties” to those agencies? I don’t think I do, but I’m not willing to gamble on what the IRGC is going to make of those connections. I think this recent series of arrests is a real shame, because it is going to make people like me think more than twice about visiting Iran. And particularly because, in the case of Nizar Zakka, he was actually in Iran by invitation of the government to attend a conference. That’s basically why I would visit Iran if I were to go. I’ve talked to several Iranian friends about this possibility in the past, and I was basically just waiting for the right opportunity to accept such an invitation. But honestly I’m not going to do so at this point. I think I understand at least partially the politics involved. After the JCPOA was agreed, the conservative elements of the Iranian government have wanted to reassert themselves, and apparently they think that arresting foreigners with ties to foreign governments they don’t like will send a message of strength and continued antipathy towards those governments. Well, it may be doing that, but I don’t see that as in any way a constructive move for the country and its interests. I don’t see how Iran’s interests are served by dissuading academics and businessmen who are generally in favor of increased engagement between Iran and the world, from visiting the country. But maybe that’s also on the agenda of the authors of this new policy – to generally discourage engagement between Iran and the rest of the world. If it is, then congratulations. I think it will work.